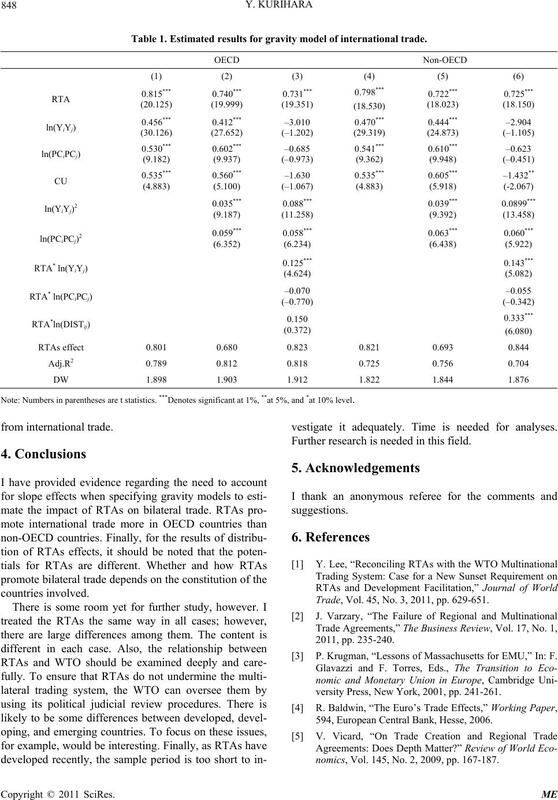 RTAs promote international trade more in OECD countries than in non-OECD countries. of the multinational trading system . using GDP) and distance between two units (countries). trade integration may help correlate national incomes. increased trade in agriculture between their members. is that RTAs are recent phenomenon in the world. therefore essential to examine the effects of RTAs. onstrates the empirical methods and the data used here. ends with a brief summary. This paper’s fixed effect model is similar to [12,13]. if countries belong to the same regional trade agreement. ined in the next section. The results of Equation (1) are shown in Table 1. OECD countries than for non-OECD countries. tween tra d e and GDP in OECD and non- O ECD co un tr ies . 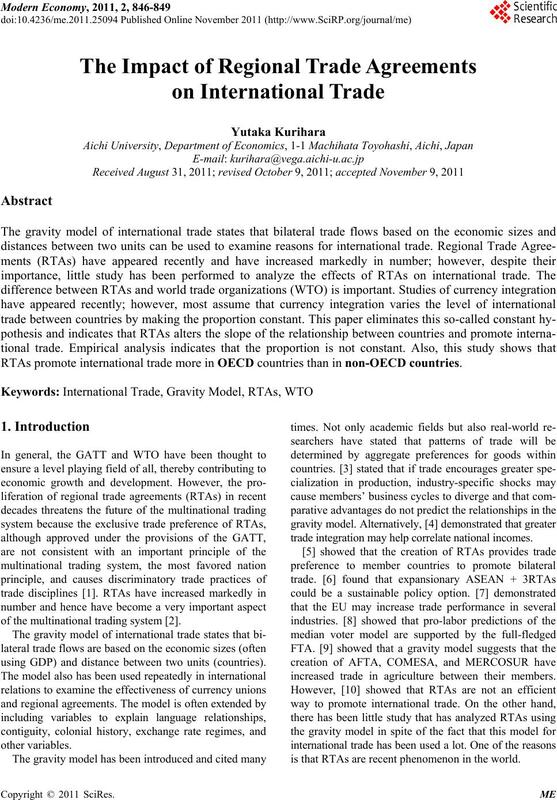 tant factor in the promotion of international trade. 0.780 for OEC D a nd 0.7 1 3 fo r no n- OECD countrie s.
trade depends on the constitutio n of the pair of countries. Table 1. 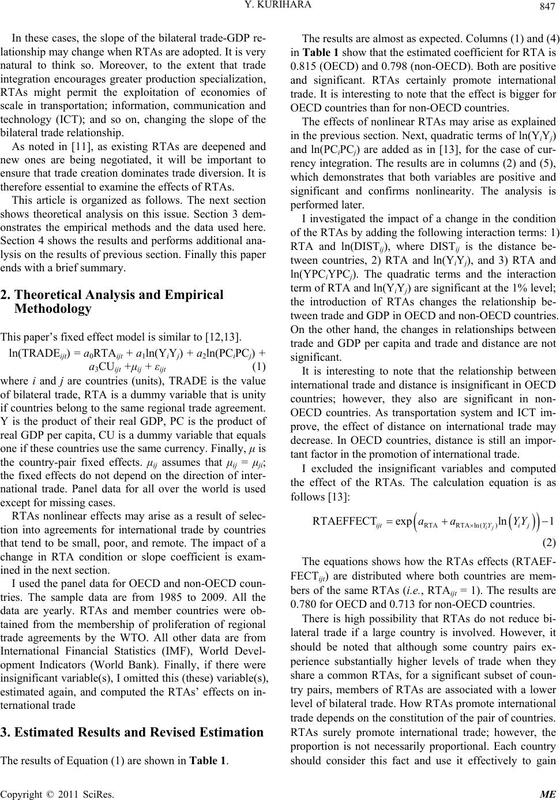 Estimated results for gravity model of international trade. Note: Numbers in parentheses are t statistics. ***Denotes significant at 1%, **at 5%, and *at 10% level. vestigate it adequately. Time is needed for analyses. Further research is need ed in this field. Trade, Vol. 45, No. 3, 2011, pp. 629-651. P. Krugman, “Lessons of Massachusetts for EMU,” In: F.
versity Press, New York, 2001, pp. 241-261. 594, European Central Bank, Hesse, 2006.
nomics, Vol. 145, No. 2, 2009, pp. 167-187. No. 2, 2009, pp. 169-194.
nomic Integration, Vol. 25, No. 4, 2010, pp. 783-817. 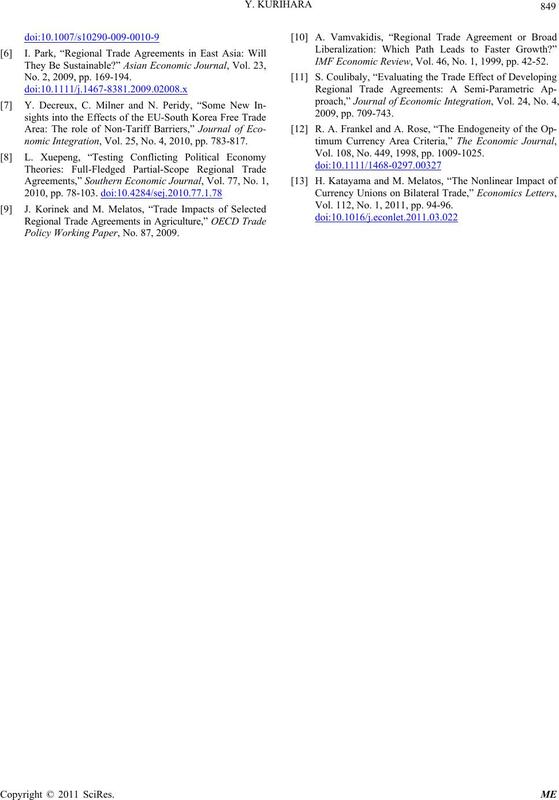 Policy Working Paper, No. 87, 2009. IMF Economic Review, Vol. 46, No. 1, 1999, pp. 42-52. Vol. 108, No. 449, 1998, pp. 1009-1025. Vol. 112, No. 1, 2011, pp. 94-96.